Always work on the principle of changing the variables as quickly as possible. If in doubt push the seedlings & expose them to heat, light & wind from an oscillating fan as soon as possible. Over summer particularly, if a seedling droops DON’T PANIC!…but reseal the bag over it & move it out of direct sunlight until it recovers. Note that some seedlings such as P. membranacea need to have very high humidity when tiny or the leaves will crumple and so are best not rushed. Damping off is caused by a number of fungus infections which all seedlings are prone to. 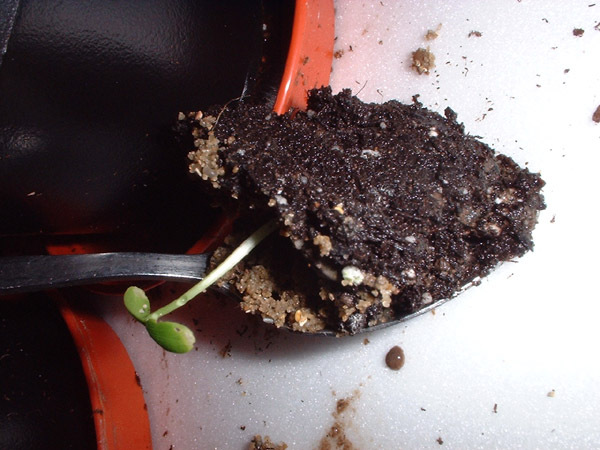 It can occur before germination – which will rot the seed, or after, which will usually result in the seedling being damaged & toppling at soil level or the roots will rot. The presence of fungus gnats is a warning sign. They will rise from the soil if the pot is tapped & are slower moving than most insects & easily caught. Damping off problems are best avoided by progressing the seedling as soon as possible using sterile soil, clean equipment, sharp sand & good air circulation. Always watering from below is also vital. Remove the propagator lid as soon as possible & always use a fan in the room to improve air circulation, which will also improve sturdiness. Never leave the soil too wet. Some seedlings are also vulnerable to mildew even with good air circulation…treat with one litre bottle of water with squirt of fairy liquid (detergent) + half teaspoon of sodium bicarbonate.